Measure Twice, Accept Once (Part 2) | Quality House Ltd.
How to Organize the Process, So That You Make Sure That Everything Goes Smoothly? What Are the Most Important Steps to Execute the “Perfect” Acceptance Testing? To answer these questions we must start with the definition of Acceptance Testing as provided by the ISTQB. So, the Acceptance Testing is a “formal testing with respect to user needs, requirements, and business processes conducted to determine whether or not a system satisfies the acceptance criteria and to enable the user, customers or other authorized entity to determine whether or not to accept the system. Acceptance Testing is also known as User Acceptance Testing (UAT), end – user testing, Operational Acceptance Testing (OAT) or field (acceptance) testing”. There are different types of acceptance testing that should be performed under different circumstances and regulations. For example, the most well – known is the user acceptance testing where the criteria for “done” are usually created by business customers and expressed in a business domain language. Very popular is also the operation acceptance testing where the criteria are defined in terms of functional and non – functional requirements. Also, contract and regulation acceptance testing are executed where the criteria are defined by agreements or state laws, regulation. 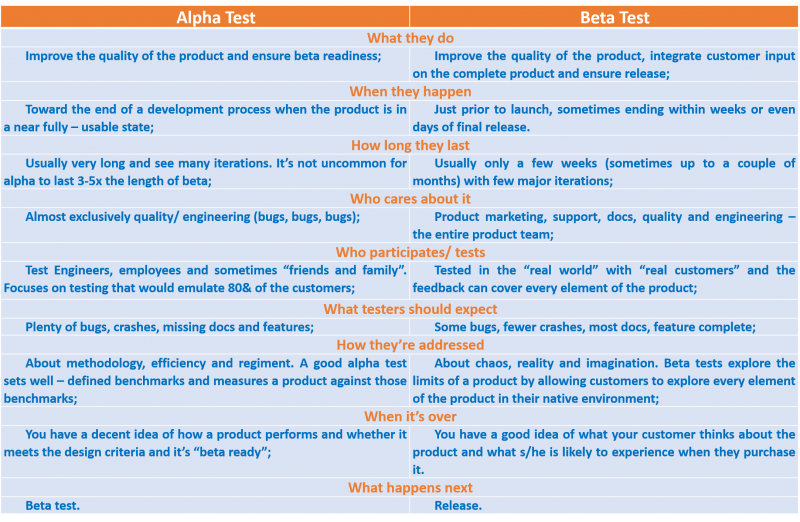 The most well - known are the alpha and beta acceptance testing. What do they consist of? – Developers of market software products often want to get feedback from the potential or existing customers in their market before the software is put for sale commercially. That is when it comes to the alpha and beta testing. Alpha testing is performed at the premises of the developing company, not by the developers themselves. Usually, QAs that were not involved in the project, which provides the certainty of an independent and unaffected testing. This activity is quite often outsourced which even guarantees greater independence of opinion as you will not harm the reputation and the feelings of your colleagues. Beta testing, also known as field testing is performed by users or potential users at their own location. Many companies, quite often even start-ups consider this type of testing as a free acceptance testing. You release the software and the customers do the testing job for you – finding and reporting the bugs. This also shows which functionalities are of greatest importance for the end – users and where the development efforts should be focused. It sounds great, especially if you lack the budget to perform acceptance testing and you have a tight budget on the other types of testing. Yes, the end user may do it for you, but are you sure that every bug encountered will be reported, are you sure that even reported the bug is clearly described? Think about how much resources you will spend trying to identify a bug poorly described. And, after all, who will use your software if it turns out that your beta release was a really lousy product? Do not ever forget that in the modern world people are communicating very easily and the opinions in the forums for the products really decide what products the mass of the users will download and use. Our advice is to be very carefully when making a beta release and please, make sure you had an alpha testing in advance. And while all other types of testing has the initial intent to reveal errors, the Acceptance Testing is actually a crucial step that decides the future of a software and its outcome provides quality indication for customers to determine whether to accept or reject the software. Having seen the main acceptance testing types, you are about to learn more what the primary approach includes and to take the basic steps to organize a well – done Acceptance phase. Some tips about that you can find in our next article dedicated to the Acceptance Testing. Expected in January!